The Consumer Price Index (CPI) rose 1.4% on a year-over-year basis in August, following a 1.2% gain in July. Prices were up in six of the eight major CPI components in the 12 months to August, with the transportation and shelter indexes contributing the most to the year-over-year rise. The clothing and footwear index and the household operations, furnishings and equipment index declined on a year-over-year basis. Transportation costs rose 2.8% on a year-over-year basis in August, following a 1.9% increase the previous month. As in July, gasoline prices contributed the most to the gain in transportation prices and to their acceleration. The gasoline index rose 8.6% in the 12 months to August, following a 4.6% increase in July. Air transportation costs grew at a greater rate on a year-over-year basis in August than in July. In contrast, the rail, highway bus and other inter-city transportation index rose less on a year-over-year basis in August. The shelter index increased 1.3% year over year in August, matching the gain in July. Homeowners' replacement costs contributed the most to the increase in prices, rising 4.2% in the 12 months to August. Prices for natural gas (+8.6%) increased at a slower year-over-year rate in August than in July. The electricity index was down 8.9% year over year in August, partly reflecting provincially legislated price reductions in Ontario earlier in 2017. Consumer prices for food rose 0.9% on a year-over-year basis in August, after increasing 0.6% in July. Prices for food purchased from stores grew 0.3% year over year in August, following a 0.1% decline in July. Meat (+1.1%) and fresh fruit (+5.6%) prices grew at greater rates in August than in July. Prices for food purchased from restaurants rose 2.6% in August, matching the year-over-year gain in July. In August, the household operations, furnishings and equipment index (-0.2%) was down on a year-over-year basis for the second consecutive month. The furniture index contributed the most to this decline, down 2.7% in the 12 months to August. Prices for household appliances declined 3.0% year over year in August, following a 2.0% decrease in July. Meanwhile, the tools and other household equipment index (+0.9%) rose less on a year-over-year basis in August than in July. Consumer prices rose more on a year-over-year basis in nine provinces in August than in July, while the CPI in Manitoba registered the same increase as the previous month. Saskatchewan posted the largest acceleration in consumer prices among the provinces, partly attributable to further changes in the province's Provincial Sales Tax (PST), effective in August. In Saskatchewan, the CPI increased 1.7% on a year-over-year basis in August, after rising 0.8% in July. This acceleration was partly attributable to the application of PST to insurance services in Saskatchewan that became effective in August. Month-over-month increases were recorded in the passenger vehicle insurance premiums index (+5.9%), homeowners' home and mortgage insurance index (+6.3%), insurance, licences and other services for recreational vehicles index (+3.2%), and tenants' insurance premiums index (+6.3%). Year over year, prices for food purchased from restaurants rose 8.7%, largely attributable to PST changes from the spring. Homeowners' replacement costs fell 0.7% in the 12-month period ending in August, while they rose 4.2% at the national level. 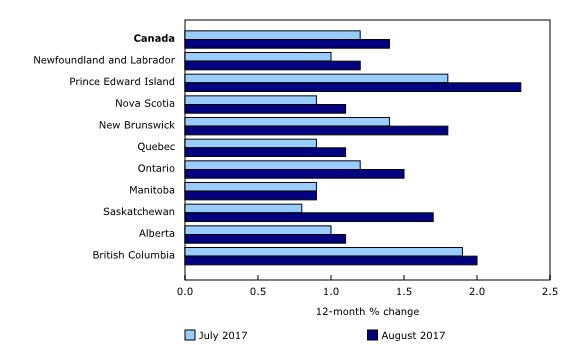 Consumer prices in Prince Edward Island rose 2.3% year over year in August, after increasing 1.8% in July. The large growth rate in consumer prices, relative to the other provinces, remains partly attributable to an increase in the Harmonized Sales Tax (HST) in Prince Edward Island that took effect in October 2016. The traveller accommodation index also contributed to the 12-month increase in the CPI, rising 23.0% on a year-over-year basis in August, following a 19.1% increase in July. Prices for fresh fruit fell 9.3% in the 12-month period ending in August, while they rose 5.6% at the national level. The CPI in Manitoba increased 0.9% year-over-year in August, matching the gain in July. Consumers paid 12.8% more for fresh vegetables in the 12 months to August. At the same time, the natural gas index declined more in Manitoba than in any other province. On a seasonally adjusted monthly basis, the CPI increased 0.2% in August, matching the gain in July. In August, five major components increased on a seasonally adjusted monthly basis, while three decreased. On a seasonally adjusted monthly basis in August, the transportation index (+0.8%) posted the largest gain, while the recreation, education and reading index (-0.2%) posted the largest decline. Since 1971, beef prices have been rising steadily, at about 5% per year, on average. However, beef prices have gone up considerably in recent years. In 2014, beef prices rose 14% on an annual average basis; in 2015, they grew another 15%. These sharp increases were mainly triggered by lower cattle inventories in Canada and the United States. In the four years leading up to the price spikes, Canadian and US cattle inventories declined by about 8%. Inventories fell mainly as a result of higher feed costs, severe weather (notably drought), and additional demand coinciding with disease outbreaks in other livestock. In 2016, beef prices stabilized, falling around 1%. Despite this decline, prices in 2016 remained nearly 30% higher than in 2013. The depreciation of the Canadian dollar and its sustained weakness since 2014 may have also contributed to higher beef prices in Canada in recent years. A seasonally adjusted series is one from which seasonal movements have been eliminated. Users employing CPI data for indexation purposes are advised to use the unadjusted indexes. For more information on seasonal adjustment, see Seasonally adjusted data – Frequently asked questions. The Consumer Price Index (CPI) measures the change in prices of consumer goods and services over time. 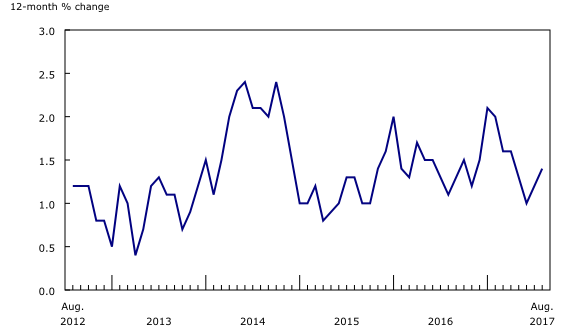 In order to accurately reflect changes in the market and in consumer behaviour, Statistics Canada periodically reviews and updates the methods applied to the various components of the CPI. The release of the August 2017 CPI (published on September 22, 2017) marks the implementation of a new gasoline index methodology. The gasoline component represents 3.37% of the 2015 CPI basket at link month (December 2016) prices and is part of the transportation index, which is one of the major CPI components. The gasoline index methodology changes consist of two main elements: collection of prices in more cities, and over more days of the month (every business day); and, a new aggregation formula. The indexes for each geographic stratum use an explicitly weighted Jevons index formula. The population count for each city, drawn from the census, is the source for weighting. The release of the October 2017 CPI (to be published on November 17, 2017) will mark the implementation of new data sources for the calculation of the Mortgage Interest Cost Index (MICI). The MICI represents 3.41% of the 2015 CPI basket at link month (December 2016) prices and is part of the shelter index, which is one of the major CPI components. The new data sources will use administrative data to replace survey data, which will reduce survey response burden, while better reflecting the Canadian residential mortgage market, and will allow for a simplified estimation process. A detailed documentation describing the MICI methodology will be available with the October 2017 CPI release on November 17, 2017. Data on inter-city indexes of price differentials of consumer goods and services will be updated to October 2016 with the release of the October 2017 CPI (to be published on November 17, 2017). At this time, the geographic stratum "Calgary, Alberta" will be introduced in the table reflecting data for the all-items index and its eight major components. Real-time CANSIM table 326-8023 will be updated on October 10. For more information, consult the document Real-time CANSIM tables. The CPI for September will be released on October 20. 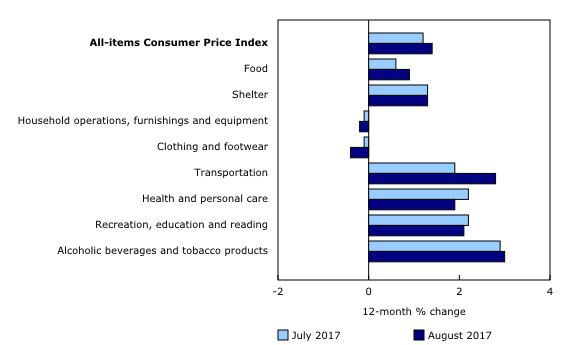 The August 2017 issue of The Consumer Price Index, Vol. 96, no. 8 (Catalogue number62-001-X) is now available. 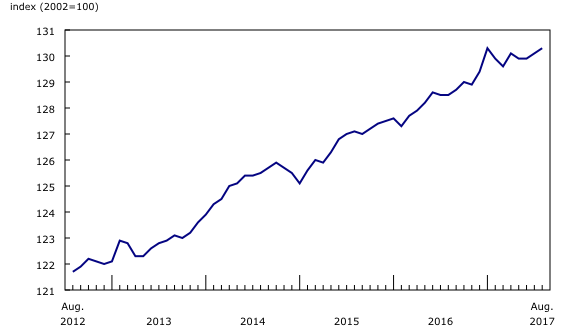 More information about the concepts and use of the Consumer Price Index (CPI) is available in The Canadian Consumer Price Index Reference Paper (Catalogue number62-553-X). 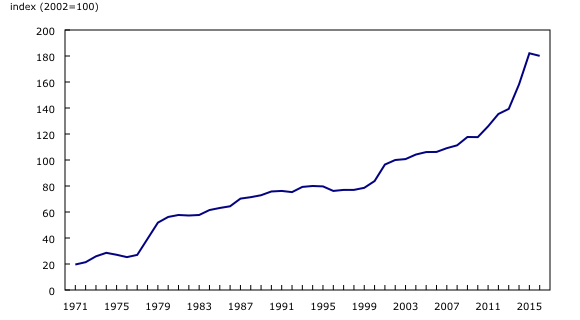 For information on the history of the CPI in Canada, consult the publication Exploring the First Century of Canada's Consumer Price Index (Catalogue number62-604-X). Two videos, "An Overview of Canada's Consumer Price Index (CPI)" and "The Consumer Price Index and Your Experience of Price Change," are available on Statistics Canada's YouTube channel.